Fun fact: The multi-sided white building on Foothill west of Haven began as a Spires, became Foothill Grill in 2000 and reverted to a Spires in 2007. Question: Can we get Foothill Grill back? Jodie Holt of UC Riverside, a professor of plant physiology, will participate in a Q&A at the Edwards Ontario Palace 22 at Ontario Mills at 6:30 p.m. Saturday concerning James Cameron’s new SF movie “Avatar.” Holt provided botanical expertise for the depiction of the movie’s fictional moon, Pandora, and its ecosystem. Well, it’s not like having Cameron here, but it might be fun. Reader Larry Mendoza, who works at Richard Hibbard Chevrolet in Claremont, keeps a Henry’s menu in his office. 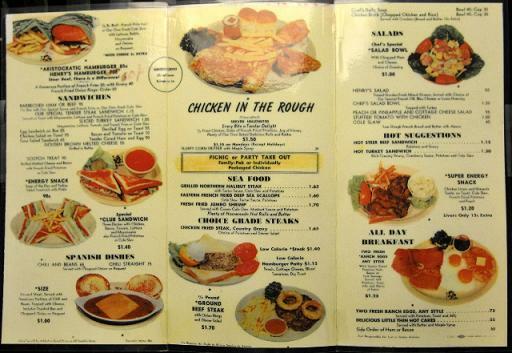 The date on the menu is 1966 and the prices should either bring back memories or arouse envy. The most expensive meal is $1.70, a burger is 70 cents, fries are 30 cents (40 cents with gravy) and Cokes are 15 cents. For carhop customers, “minimum service 25 cents per person average per car.” The signature “chicken in the rough” (half a chicken, fries, two dinner rolls and honey) is $1.50, or $1.10 on Mondays. I reduced the tri-fold menu to fit on this page. If you want to study it closely, click on the thumbnail versions below. 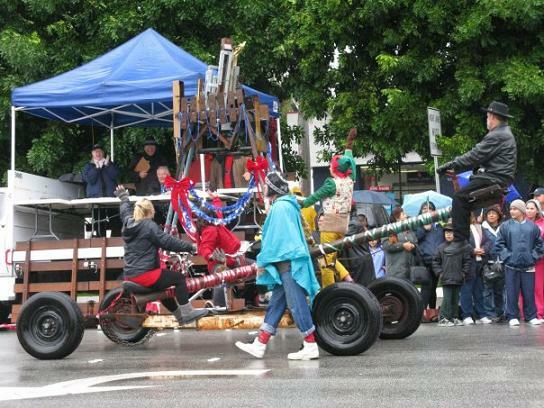 It was wet and only slightly wild for Saturday’s parade. Here’s a link to Bulletin photographer Thomas Cordova’s gallery of 17 photos and a link to the Downtown Pomona blog; scroll down to the parade photos. A host of young tykes gathered up in a room. All watching and waiting for the one yet to come. Looking up and around for to glimpse Mister Grinch. As he read and he spoke to each eager young child. Local kids who rely on the Literacy Center. At loose ends for lunch Wednesday, I headed south on Euclid from downtown to see what I might find. In a shopping plaza with a Food 4 Less on the southwest corner of Euclid and Philadelphia, I found Tortas Sinaloa, which beckoned with the promise of a cheap, filling meal. Walking through the doors was a “wow” moment. The space has unusually high ceilings and is cavernous, encompassing what were probably two adjacent storefronts originally. Three giant murals fill one wall, with a fourth mural on another. There’s plenty of seating, the tables placed far apart. The first impression is that it’s quite an operation. 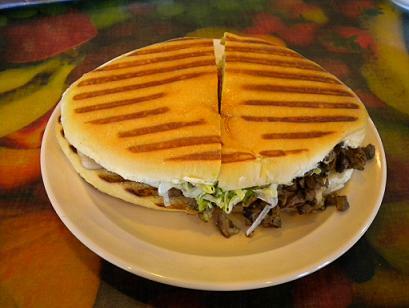 The menu has 60 tortas from $2.50 to $5.99. These are grilled Mexican sandwiches, for the uninitiated. A large variety of juice drinks, licuados and smoothies are offered. The menu is in Spanish, which poses a challenge, but the two servers I talked with were bilingual. I went for a Fontana sandwich ($5.95): carne asada, avocado, cheese, mayo, lettuce, tomato, onion and refried beans, and a strawberry-pineapple-papaya smoothie ($4.25). The drink came in a mug 7 inches tall, so they didn’t skimp. The sandwich was delicious, rivaling the ones at Los Jalapenos in Rancho Cucamonga, my favorite. But the choices are far more limited there. 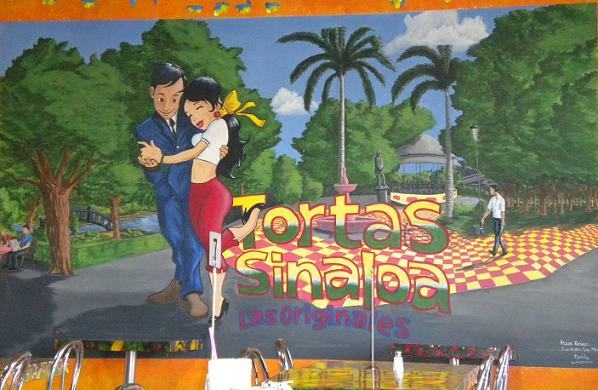 Tortas Sinaloa has other locations, including Tijuana, but the main office is Ontario, according to the menu. Plenty of light comes through the expanse of windows. The tables are decorated with fruit art and the shelves behind the counter are stocked with fresh fruit. It’s a neat atmosphere that offers one of those pleasant am-I-in-Ontario moments. It just goes to show, if you go searching and keep an open mind, there’s no telling what you’ll find. We all remember Charles Phoenix, the midcentury maven and slide show entrepreneur who makes the past fun, right? He’ll give a slide show in Pomona on Saturday and lead a tour his native Ontario on Sunday. You can read more about both in Friday’s column, but let me give you the appropriate linkages for tickets and more info. This is the first time he’s done his holiday show in the Inland Valley; other locations on his tour are Pasadena, Hollywood, Portland and Seattle. Tickets for the Pomona show are $26.95. 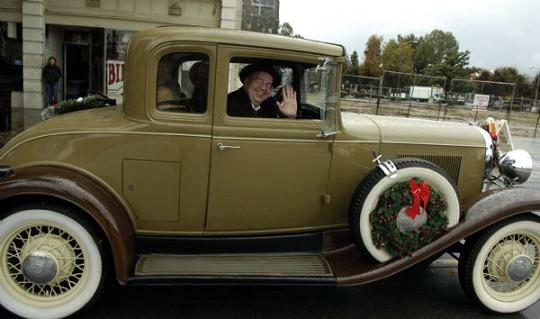 Read about the Charles Phoenix Hometown Holiday Tour here, and buy tickets there if you like. 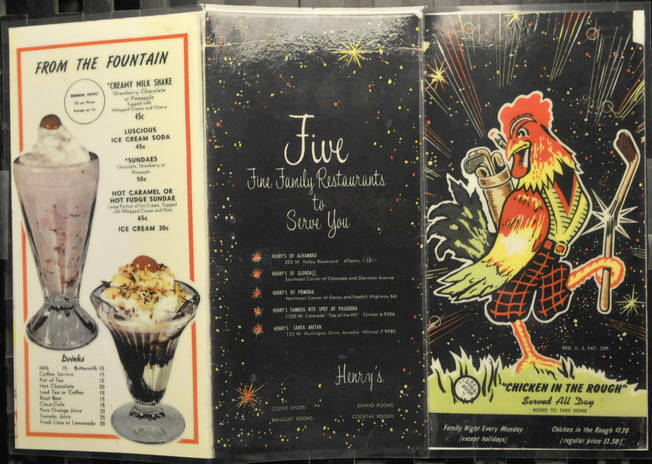 Phoenix also wrote recently about one of this tour stops, Logan’s Candies, an Ontario institution since 1933. A Pomona College senior is at the United Nations Climate Change Conference in Copenhagen, blogging. Grace Vermeer is writing about her experience at COP15 on the college’s Environmental Analysis Program website, www.dispatches.pomonaea.org. The opening day ceremony “began with a video full of activist imagery — scared children running from climate change induced floods and storms, their teddy bears falling in their wake,” Vermeer writes, eyes rolling. President Obama is scheduled to arrive today and we’ll see how Vermeer takes it all in. She’s there with Pomona senior Dawn Bickett, Scripps senior Elizabeth DeGori, two University of Texas students and Pomona political professor Richard Worthington, all granted observer status as a research, nongovernmental organization. The conference began Monday and ends Dec. 18. The purpose is to come up with a global climate change agreement to replace the Kyoto protocol, which expires in 2012. You’ll have to compare the train numbers to the Metrolink schedule to figure out which trains may be cut. But here’s a shorthand version. On the heavily used San Bernardino Line, two trains would be cut weekdays and two on Sundays. Four would be cut on Saturdays, including — sob! — the 11:30 p.m. train, the last one on the line and one that allows some of us to take the train to and from evening events in L.A. Ridership of that late train, which was launched in 2006, has always been light. In a welcome softening of the blow, the penultimate train, which leaves L.A. to head east at 9 p.m., will depart at 10 p.m. instead. Not a bad compromise. Saturday trains would then leave Union Station at 3:25, 5:45 and 10 p.m.
As usual with the 909, progress comes as two steps forward, one step back. Books bought this month: “The Art of the Lathe,” B.H. Fairchild; “Early Occult Memory Systems of the Lower Midwest,” B.H. Fairchild; “Usher,” B.H. Fairchild. Books read this month: “The Circus of Dr. Lao and Other Improbable Stories,” ed. Ray Bradbury; “The Art of the Lathe,” B.H. 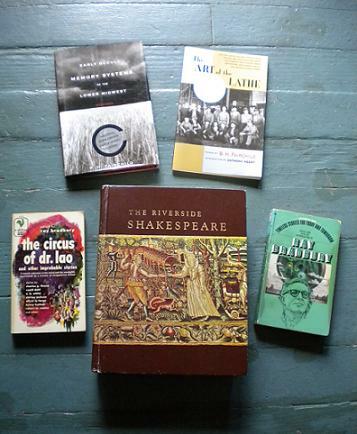 Fairchild; “Richard II,” William Shakespeare; “Timeless Stories for Today and Tomorrow,” ed. Ray Bradbury; “Early Occult Memory Systems of the Lower Midwest,” B.H. Fairchild. 2009 is winding down and so is my year of reading. Yet in November I raged, raged against the dying of the light by galloping through five more books. Why, you’d think it was March or something. This month saw me read two collections by Claremont poet B.H. Fairchild, two fantasy anthologies from the 1950s edited by my boy Ray Bradbury and, just to mix it up, a play by William Shakespeare. The Fairchild books were fine stuff, and acclaimed: “Art of the Lathe” (1998) was a National Book Award finalist, “Early Occult Memory Systems” (2003) a National Book Critics Circle Award winner. The working class, oil fields, the desolation of the small-town Midwest, memory, baseball, jazz, old movies and art are among his subjects. Anyone who can base a good poem on “Creature From the Black Lagoon” should earn our admiration. The Bradbury-chosen anthologies (featuring only one Bradbury story between the two of them) were intriguing, full of surprising choices. Authors such as John Cheever, John Steinbeck, E.B. White, Christopher Isherwood and others who aren’t fantasy writers managed to have written something with a fantastic element, and that was good enough. Bradbury was obviously trying to legitimize his chosen field. Many of these stories originally appeared in the New Yorker. Shirley Jackson, author of “The Lottery,” is represented in each book, with stories that make me want to read more by her. Ditto with Robert M. Coates, whom I’d never heard of before. His story “The Hour After Westerly,” in “Timeless,” is about a New England commuter who loses an hour on a drive home through the country and remembers none of it; he later retraces his possible route and finds hints he made quite an impression. The whole thing is tantalizingly elusive. The “Dr. Lao” book is long out of print, although I found up a copy a few months back for $3. The “Timeless” book is out of print too, but less far, and ’70s editions can still be found at used bookstores. As for Shakespeare’s “Richard II,” a production of that was performed recently at Pomona College and I thought I’d reread the play, for the first time since college, before seeing it. It’s one of his history plays and, while not his A material, even his B material is nothing to sneeze at. This brings me to 55 books for the year. I’ve already finished a 56th and am expecting to end the year at 58. No point in running up the score.